The Ebac Amazon 15 litre dehumidifier sits at the bottom of Ebac’s range, along with the 12 litre model, which is exactly the same as the 15 litre in size, weight and controls. The 12 litre is simply less powerful and because of this, it is slightly cheaper. The 15-litre version is the pick of the two models, so that is the model that we’ll focus on in this review. The Ebac 15 litre sits in very competitive territory, with top-selling models from DeLonghi and EcoAir to peg it against and that’s exactly what we’ll be doing in this review. Is the Ebac 15 litre a wise purchase? The appliance is controlled through two manual rotary dials mounted on the top of the unit. The left hand dial controls the fan speed, of which there are two to choose from. It’s a great bonus to have two fan speeds on a ‘budget’ dehumidifier such as this, as often you’ll only see one on a dehumidifier with manual controls. Having two fan speeds gives you the benefit of greater extraction power when you need it and both quietness and energy efficiency for everyday usage when the power is not required. “Initially set to maximum by turning the humidistat dial fully clockwise. 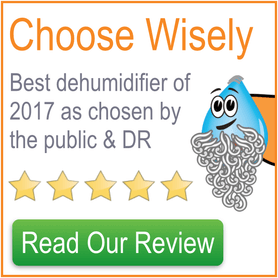 When signs of excess moisture (such as condensation) are reduced, gradually turn the humidistat dial anti-clockwise until the unit just switches off. There isn’t a dedicated laundry/ turbo mode with the Ebac 15, but you could achieve a similar effect by turning the humidistat up to max and selecting the faster of the two fan speeds. The only other aspect of the control panel to note is the light that sits between the two dials. This will illuminate when the power is on and turns red when the water collection bucket is full. Of course the machine stops dehumidifying automatically when the water bucket is full. Frustratingly there’s no on/off switch on the machine, so you have to use the switch on the plug socket instead. 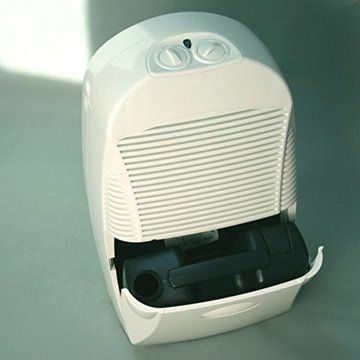 The water bucket and tray takes its design from the more premium Ebac dehumidifiers. The tray is front-loading, so there’s no requirement to rotate the machine to access it, and the water is collected inside what is best described as a Jerrycan. This design makes carrying the collected water over to the sink as simple a task as possible. The container is also very large for a dehumidifier of this power, with a capacity of 3.5 litres. The only negative here is that there’s no viewing window into the water collection tank, so to tell what the current water level is you need to open the tray and peer in, which shuts the machine down. However, of course you could just wait for the tank-full light on the control panel to illuminate. Permanent drainage is a possibility with the Ebac 15, although to do this you must order a separate kit, which costs about £15. The dust filter is found on the back of the machine covering the inlet. Ebac recommend that this is cleaned with a vacuum cleaner once a month and then replaced every 3 months. Personally speaking, with regular cleaning if the filter doesn’t look like it has clogged up, then I struggle see why it would ever need replacing. Portability is not one of the Amazon 15 litre’s strengths. First off, it is quite heavy at 13kg out of its box. This is a few kilos more than we’d like to have seen. Secondly, it seems large in size for it’s medium level of extraction power. It measures 54cm tall by 34cm wide by 25cm deep. Thirdly, the handle is of really poor design and quite awkward, particularly when considering the size and weight of the machine. 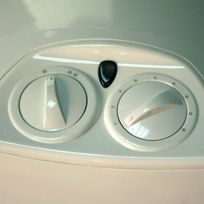 The ‘handle’ consists of a scooped-out hole in the back of the unit, near to the top. Aesthetically-speaking, the Ebac Amazon range is very bland, with few details to brighten what is otherwise a large, white, ABS plastic box with an ugly grille. From a practical side, while the handle is not very good, it’s nice to have access to the water collection tank on the front of the unit. Also, the dust filter is easy to remove and the manual control panel is simple to use once you’ve got the hang of it. 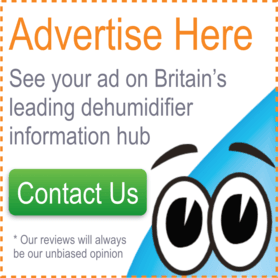 The hum of the Amazon 15 litre when it’s dehumidifying is on a par with the quietest refrigerant dehumidifiers on the market. Also, having two fan speeds is great, as the fans are very quiet on the slowest of the two speeds. In-fact, the Amazon range is the quietest that Ebac produce, generating an advertised 42dB of sound at its quietest, which again is comparable with the quietest refrigerant dehumidifiers on the market. It’s not ‘whisper-quiet’, so the noise may bother you if the Ebac 15 is kept in the bedroom or the room that you watch television, but if you were to keep it in a hallway then you certainly wouldn’t hear it behind a closed door. Like any refrigerant dehumidifier, under UK conditions the amount of water that the Ebac 15 litre extracts falls well short of its advertised 15 litres per day rate. The 15 litres per day rate was measured at 32°C and a whopping 90% humidity, tropical conditions that will very rarely be experienced in UK homes. In reality, I wouldn’t expect to have to empty the 3.5L water collection bucket more than once every one to two days. Being a refrigerant dehumidifier the hydrophilic refrigerant coils occasionally require defrosting to maintain the machines efficiency, particularly if the room temperature is lower. The good news is that the machine will do this for you automatically. Ebac rate the Amazon 15 litre to be suitable for up to a three bedroom house, and looking at the appliance’s extraction performance, this is a perfectly reasonable claim. 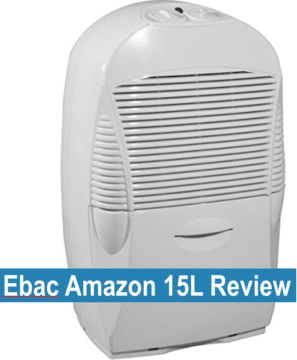 The Ebac 15 is a reasonable dehumidifier. It’s basic, but has got everything that you need and comes from one of the most trusted manufactures in terms of quality (it only comes with a one-year warranty however). Unfortunately, it is a bit pricey to my mind (best price we could find is HERE). If the Ebac 15 doesn’t take your fancy at that price, we would recommend that you also take a look at our reviews of this EcoAir and this DeLonghi, as we gave those machines higher scores.